2-3 tbsp Anar dana( for topping) and 2-3 tbsp chopped walnuts. salt adjust to your taste. Baby spinach or ice berg lettuce. Just before serving Mix the dressing ingredients and pour over the salad . Toss well once again until all combines well. Lay out the baby spinach or lettuce on a salad bowl , top it with your salad and serve. Hi ! Rabz .... Indeed a very healthy Salad . Loaded with Vitamins and Minerals . Thank U . 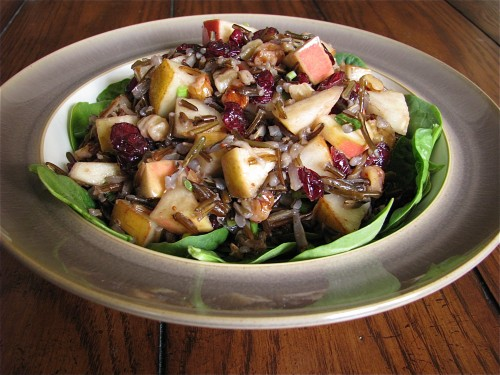 Wild Rice is a complete protein containing all of the essential amino acids. Excellent source of Fiber , Iron and Copper .Rich in B- Vitamins as well as Potassium and Phosphorous . You are so versatile , an excellent recipe for a great diet.